Popcornopolis Scores a Win as the Sponsor for NHL’s #1 Mascot, Bailey of the Los Angeles Kings Celebrating 14 Years as a Sponsor for LA Kings with MORE Giveaways, MORE Donations, and MORE Deliciousness. Popcornopolis, the family-owned and operated gourmet popcorn company, is proud to once again sponsor NHL’s Los Angeles Kings and the Los Angeles Kings’ mascot, Bailey the lion, who is ranked as the number one mascot in all of the National Hockey League for the 2018 - 2019 by ESPN. Proudly supporting the LA Kings for over 14 years, Popcornopolis is sold at concessions all year long and crowd favorite recipes including Zebra® Popcorn, Caramel Corn, Kettle Corn are available for purchase at the Staples Center. Bailey, who was also ranked the number one mascot in the NHL for the 2017-2018 season, is "known for his in-game antics against opposing fans that include popcorn showers," ESPN said. In addition to popcorn showers, to keep the excitement going all game long, Popcornopolis has supplied Bailey with popcorn to giveaway to lucky fans. During the games the crowd is encouraged to tweet from their seat with #popcornopolis and Bailey will choose one lucky winner to take home a scrumptious Popcornopolis gift basket. Additional giveaways including ‘Lucky Rows’ where an entire row of lucky fanswill be chosen to win Popcornopolis or special appearances at the LA Kings Fan Fests! 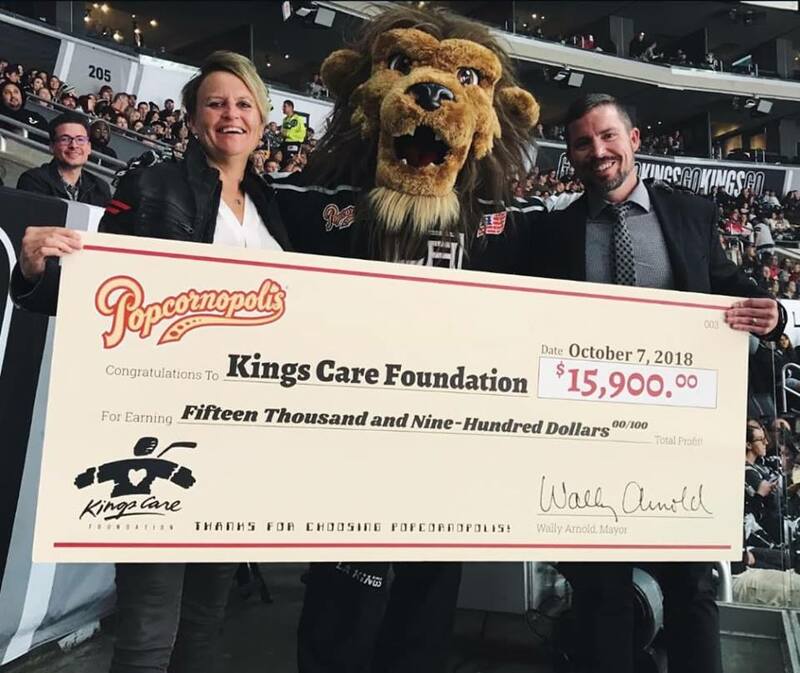 At the October 7, 2018 LA Kings game against the Detroit Red Wings, Popcornopolis was proud to present the Kings Care Foundation with a check for $15,900 from the 2018 season’s penalty kills. Popcornopolis is committed to giving back to the community and for the 2019 season, and has promised to give $250 each time the Kings get a penalty kill. Popcornopolis was founded by Wally and Kathy Arnold. In 2003, the Arnolds opened their first Popcornopolis retail store at Universal City Walk in Los Angeles, California. Today, the family-owned company’s iconic cone-shaped and bagged popcorn packages can be found in grocery and club stores, professional sports stadiums, movie theatres and at www.popcornopolis.com. Committed to giving back to the community, Popcornopolis Fundraising has helped raise more than $15 million for non-profit groups by partnering with organizations that support youth, families and education across America.